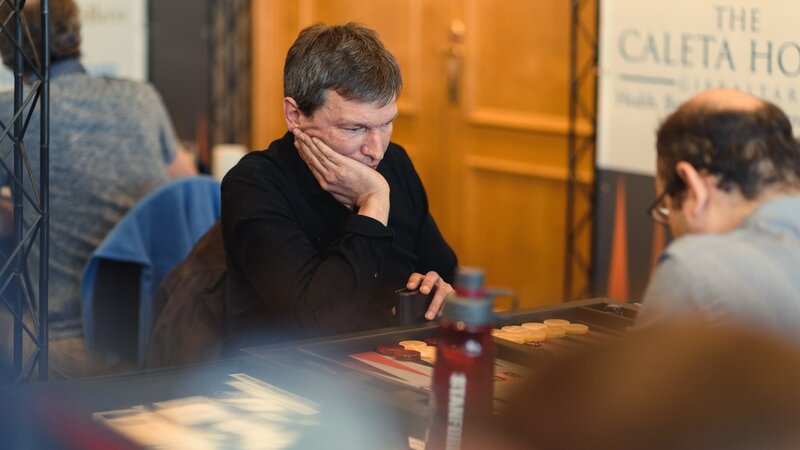 Marc Van Damme baffles international backgammon community in Gibraltar. The international backgammon event in Gibraltar (8-10 February) ranks among the most prominent tournaments in the world. Top players from all over the globe compete for victory. Several grandmasters from Denmark are present (Trabolt, Noehr, Myhr, Bredahl, …), as well as the crème de la crème from Germany (Orlowski, Papachristopoulos, Jonas, Söhnchen, Sonnabend, …), the UK (Wilkinson, Bennet, Hurst, McAlpine, …), the USA (McLaughlin, Edilson, Bauer, Matig, Neagu, …), Japan (Akiko, Kenji), Norway (Snarheim, Liby, Farewag, Kritikos, …), and other countries like Switzerland, France, etc. In this eminent and tough field, Belgium’s number 1, Marc Van Damme, succeeded in excelling. He won 5 matches in a row in the preliminary round of 11-pointers, thus gaining a bye in the final sheet of the last 32. There he eliminated the recent winner of the New York Metropolitan Open, Kimon Papachristopoulos in a crazy 15-pointer which took 21 games and culminated in a thrilling DMP-game. In the 1/4 finals Marc swept Rune Farewag (NO) off the table with exciting, aggressive play (and some luck, of course…), only to succumb to Jack Edilson (USA) in the semis. Marc reached a 15-11 lead (match to 17), but eventually saw victory slip away. Marc’s matches against Farewag and Edilson can be watched on YouTube. 2 Responses to Marc Van Damme baffles international backgammon community in Gibraltar.